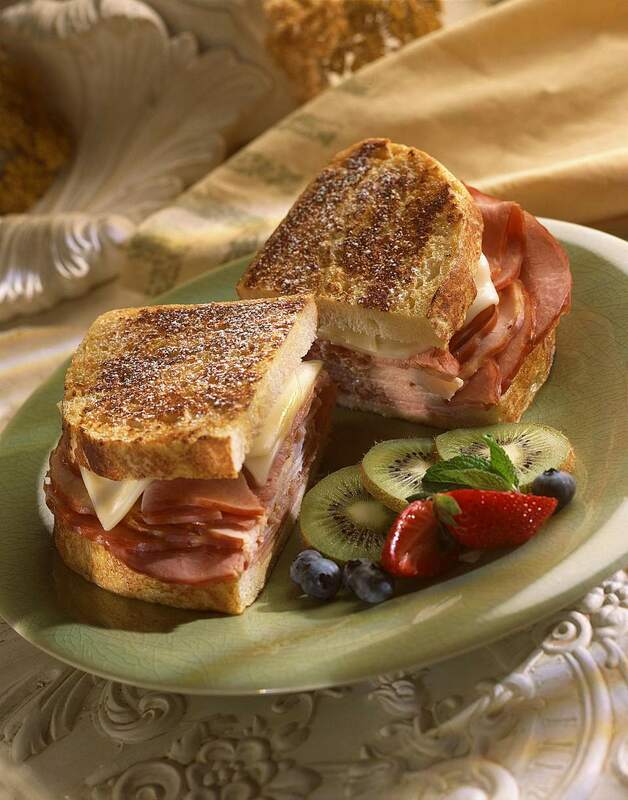 Monte Cristo Sandwiches are made with ham, two kinds of cheese, and thinly sliced chicken. They are dipped in a batter similar to one used to make French Toast, dipped into a crushed cereal mixture, then grilled to crisp perfection. These fabulous sandwiches are a real treat, and they're easy to make. Traditionally they are grilled in large amounts of butter, and you can make them that way. But try them on a George Foreman grill for all the crunch and less fat. Serve these sandwiches with a fruit salad or a green salad for a nice lunch or dinner. Spread one side of each bread slice with the Dijon mustard. Make sandwiches with the two kinds of cheese and the ham and turkey slices. In a shallow bowl, combine the egg, milk, and oil, and beat well until combined. Place the crushed cereal on a shallow plate. Dip each sandwich briefly into the egg mixture, then dip the sandwiches into the cereal mixture to coat. Grill the sandwiches in a dual contact grill or panini grill or waffle iron until they are crisp and brown and the cheese has melted, about 3 to 4 minutes total. If you want to grill the sandwiches in a pan, add about 1/4 cup butter and let it melt in the pan. Grill the sandwiches, turning once, in the hot butter for about 3 to 4 minutes per side until they are crisp and golden. Sprinkle the hot sandwiches with the powdered sugar and serve with the strawberry jam for dipping.